Now, before we get started, I know Charles and Diana were the Prince and Princess of Wales; he was not a Duke nor an Earl and it was certainly not of County Grey. In my opinion, he was a lot of things and to be honest, ‘Princely’ was never really a term I willingly applied to him. But that is another story. In going through my tea cups, I found this. My grandmother bought a piece of royal wedding commemorative china for each of her grandchildren. We (or our mothers) each chose a piece and it was carefully put away, looking forward to the day when it might be worth a fair bit of coin. That part obviously didn’t pan out very well, but I keep the tea cup safely tucked away, just the same. In looking back through Diana’s words, a number of them are rather haunting and prophetic. And while it saddens me that should would have never been Queen, I rest me in the thought that Camilla won’t ever really be either. 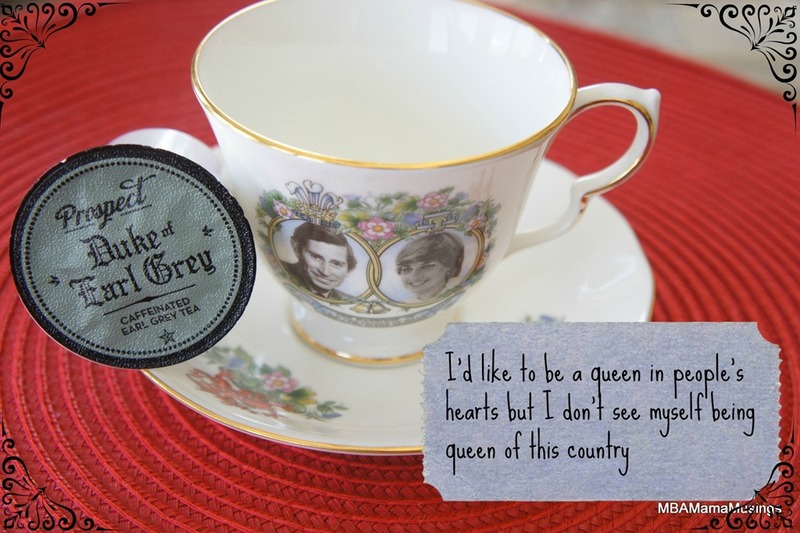 To go along with my little Royal Rant this morning, Prospect Duke of Earl Grey tea. Just the right touch of bergamot for a very tasty cuppa.